Help me clear the racks, post Hurricane Florence! This item was in my Lula storage during Hurricane Florence and was not effected by flooding. It is a clearance item so that I can empty my office space. Item washed but not worn. Size medium. lularoe julia xl. Condition is New with tags. Shipped with USPS Priority Mail. Lularoe TC Pink Purple Peach and Yellow Rose/Floral Leggings! Here for sale is the well known Nicole style dress. Easy to wear, always comfortable and it looks nice on most body shapes. Smoke free home. The color is very pretty! NWT LuLaRoe XL Julia Blue and Gray Striped Will combine shipping at checkout but you must pay for all items at the same time. Highest shipping plus $2 for each additional item. This dress is perfect for the upcoming Fall season with it's rich colors of red, turquoise, purple and yellow. Fitted bodice with a full circle flared skirt. Size: Small. NWOT Lularoe XL Womans Randy Top. Super soft!! NWOT Lularoe XL Womans Randy Top. Super soft!!. Shipped with USPS First Class Package. Lularoe Julia, Large - dark pink with grey Gray Marbeling. Brand new, I removed the tags and then never wore it. Like new small Lynnae - grey background with green and purple design. Only worn and washed once per instructions! Never worn! Pocket on left side. Easy to tie up with jeans or dress up! Fits sizes 2-8, comfortably! 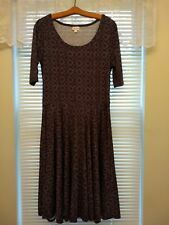 NWT LuLaRoe CiCi Flounce Dress Extra Large. Condition is New with tags. Shipped with USPS First Class Package. NWT LuLaRoe CiCi Flounce Dress 3XL. Condition is New with tags. Shipped with USPS First Class Package. LuLaRoe Large Carly. Shipped with USPS Priority Mail. Brand new with tags!!! Perfect for holiday parties! Black with blue dots. I bought this last Christmas to wear for a party but it was too big, it's just been hanging in my closet...it needs a home! Smoke free, pet free home!!! NWT LuLaRoe CiCi Flounce Dress Small Gray. Condition is New with tags. Shipped with USPS First Class Package. We will work our hardest to resolve the problem for you. Size Tall & Curvy (12-18), in good preowned condition. Never worn or washed. New without tags. Smoke free, pet friendly home. Worn twice! Gorgeous floral print Ana! Floor length. Retails for $60! 95% polyester 5 elastano, dress is in like new cond. Purple, paisley print covers this Patrick top. Perfect for men or women alike! Fast shipping!! Julia - sheath style LL8. Maroon color with floral print. NWT Carly Dress XS Cool print. Condition is Pre-owned. Excellent condition. NWOT LuLaRoe Irma Small Coral Floral And Paisley . SUPER stretchy!! LENGTH 29.5 in. MATERIAL : Spun Polyester / Spandex. Lularoe OS Valentine leggings brand new with tags,still in package.Pink background with red chevron and white lace looking hearts. 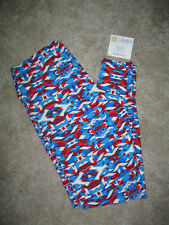 Used condition Lularoe Randy Size Small! I have worn this a few times, does has some piling by underarms and front chest. Still in great condition! Light gray body with floral sleeves! Smoke Free Pet Friendly Home! Lularoe Randy Small. Condition is Pre-owned. Shipped with USPS First Class Package.